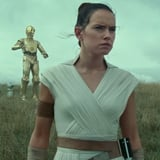 The first teaser for Star Wars: Episode IX - officially dubbed Star Wars: The Rise of Skywalker - has arrived, and though brief, it reveals a lot about what we can expect from the final installment of the recent trilogy, including the "new" villain. Palpatine - the previous Dark Lord of the Sith who looks like a withered lemon and also went by the moniker Darth Sidious - was previously played by Ian McDiarmid in the first two trilogies, and was thought to be dead after being taken out by Darth Vader in 1983's Return of the Jedi. Palpatine rose to infamy after becoming an apprentice for Darth Plagueis, and later conspired to restore the Order to galactic dominance by force, killing many along the way. Despite his death, Sidious's legacy is what the First Order bases their regime on in The Force Awakens, with Supreme Leader Snoke helming the successor to the Empire. McDiarmid, 74, was on hand at the Star Wars Celebration event, and boomed "roll it again" in character onstage as the trailer replayed. He's played the villain four out of the five times the character has appeared in the franchise - Return of the Jedi, The Phantom Menace, Attack of the Clones, and Revenge of the Sith. Since Snoke has (presumably) been eliminated for good thanks to the end of The Last Jedi, Palpatine is a fittingly familiar face to bring back. It's also worth wondering how, exactly, Palpatine will been seen in the third film. Did he actually die in that explosion in Return of the Jedi? Will we be seeing his Force ghost? Or did he miraculously survive and is now older and more deformed than ever? We'll have plenty of time to mull it over since Star Wars: The Rise of Skywalker doesn't hit theaters until Dec. 20.